Letters and Papers, Foreign and Domestic, Henry VIII, Volume 4, 1524-1530. Originally published by Her Majesty's Stationery Office, London, 1875. 4314. JOHN CHEKYNGE to CROMWELL. Would be glad to hear of his health. All here are well, "as the Frenscheman saythe, a cap ay pe." Wants money in part compensation of his pains, which he had not intended to ask till the whole year commenced at Midsummer. Found Erasmus's edition of the works of St. Austin so necessary, that he must have them if he laid his gowns in pledge. Has bought a copy for 5l., to be paid at St. Matthew's Day. Has bought other books, but of no great value. Pembroke Hall, Cambridge. Hol., p. 1. Add. 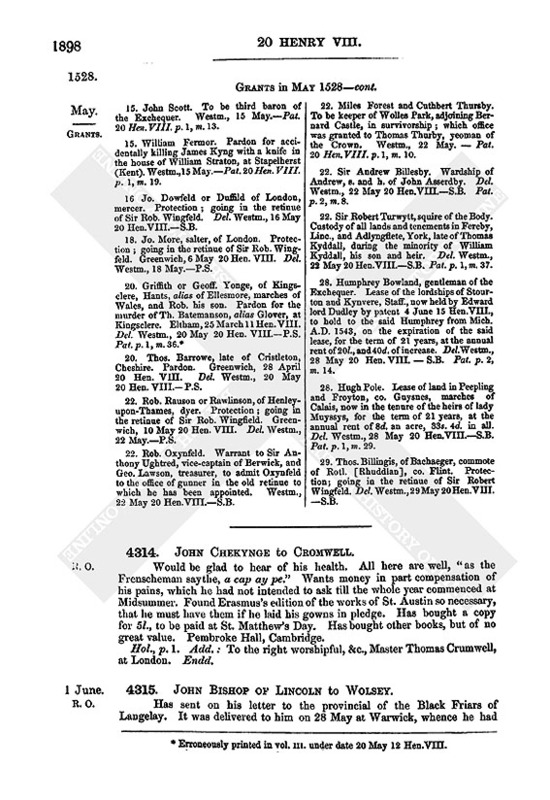 : To the right worshipful, &c., Master Thomas Crumwell, at London. Endd. 4315. JOHN BISHOP OF LINCOLN to WOLSEY. Has sent on his letter to the provincial of the Black Friars of Langelay. It was delivered to him on 28 May at Warwick, whence he had his woman Agnes Pastloo. He has lately sent her back, and married her to a servant of his. Dr. Tomeson, of the same religion, will attend with other brethren, to inform Wolsey about him. Incloses the "detections" made by the most honest people of Dunstaple. Was first told of this by the Queen, who insisted on his reformation, and said he should not live in a house of which she was foundress. Told her he would show it to the ordinary. It is a pity such a man should be a head of Christ's church. Has admonished him privately, and by letter. As reformation does not ensue, and the party is in his diocese and exempt, will follow the counsel of the Gospel, "Dic ecclesiæ, &c."
Asks him to take such order as is necessary. There is little religion kept at the house, and it is in utter decay. A provincial was never prior before this man, but always some one who was under visitation of his "fadren;" but this man has no reformator but Wolsey as legate. Shall be at Lidington next week, and soon after at Peterborough. Wooborn, 1 June. Hol., pp. 2. Add. : To my lord Legate. 4316. JOHN BISHOP OF LINCOLN to THOS. HENNAGE. Requests him to obtain for the bearer, Sir Ric. Bayly, the chantry of the Irons in Lincoln Cathedral, which is now void, and in Wolsey's gift. "He is a poor vicar of my cathedral church. Thus ever I put you to pains. Or tonight or tomorrow ye shall receive a warrant for two bucks in Stowe Park." Wooborn, 1 June. Hol., p. 1. Add. : "To mine especial loving friend Master Thos. Hennage." 4317. ERASMUS to HENRY VIII. Thanks him for his letter inviting him to England, at a time when he is troubled by various afflictions, labors, and ill health. Was afraid of the length of the journey, perils by robbers, and the annoyance of the sea, but yet sent his servant to England as a preliminary step. Since his departure at Easter time, was so sorely attacked by disease that he thought he should have died. Hears from his servant, who is returned, that bands of soldiers are prowling everywhere, and that the duke of Gueldres threatens war. If he can do anything by his pen to please the King, he will not fail. Basle, 1 June 1528. 4318. MONASTERY OF ST. ALBAN'S. 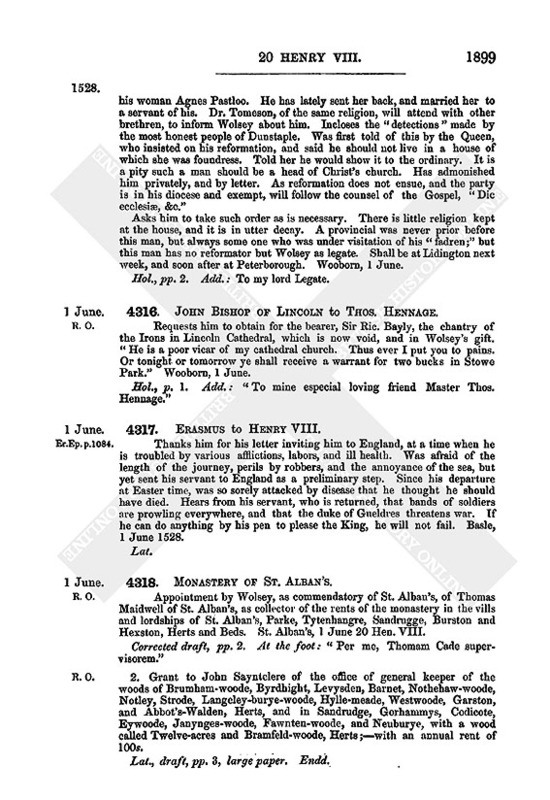 Appointment by Wolsey, as commendatory of St. Alban's, of Thomas Maidwell of St. Alban's, as collector of the rents of the monastery in the vills and lordships of St. Alban's, Parke, Tytenhangre, Sandrugge, Burston and Hexston, Herts and Beds. St. Alban's, 1 June 20 Hen. VIII. Corrected draft, pp. 2. At the foot: "Per me, Thomam Cade supervisorem." 2. Grant to John Sayntclere of the office of general keeper of the woods of Brumham-woode, Byrdhight, Levysden, Barnet, Nothehaw-woode, Notley, Strode, Langeley-burye-woode, Hylle-meade, Westwoode, Garston, and Abbot's-Walden, Herts, and in Sandrudge, Gorhammys, Codicote, Eywoode, Janynges-woode, Fawnten-woode, and Neuburye, with a wood called Twelve-acres and Bramfeld-woode, Herts;—with an annual rent of 100s. Lat., draft, pp. 3, large paper. Endd. On receipt of Wolsey's letters of the 23rd, sent immediately a servant to Paris to see what could be done to forward Wolsey's letters to Dr. Stephyns, at the court of Rome. On the 30th, went thither himself about that, and to see the King on other matters. On his arrival found means to send a courier by Peter Spina, who is factor to Ant. Vyvald, and delivers to Clerk his money by exchange. Gave him thirty ducats for the courier's charges, and was assured he should be where the Pope is in eight or nine days. Spoke with the King and my Lady, who each consented to write a letter for him. "They axyd me how that matter ded. I shewyd theym right well, saffyng that the Pope, to full off respectis, delayd the matter more then neadyd." The King said he had heard the Pope had sent his nephews to Savona, and was himself coming to Nice, in Savoy; and if he did so, he would not dare do otherwise than the King, his brother, and he, should think expedient. "I assure your Grace they both were very well willing, and my Lady said that rather than fail she would go to Rome herself for the matter." Being informed, however, by Robertet that there would be some delay in the writing of those letters, (which, indeed, he has not yet received), he sent Wolsey's off "the day abovesaid." Poysy, 2 June. Has remained here, by the King's commandment, all the month of May, though it was very desirable for his health that he should consult cunning men in London. Is somewhat better now. Can ride at a soft pace, but not walk, "the fume doth so arise in my head." Has had a sore fit every week, and his digestion is so bad he does not eat in three days as much as he did in one meal. Proposes therefore, to ride to London before next term begins. Kenynghale, 2 June. Hol., p. 1. Add. : To my lord Legate. Endd. 4321. WALLOP AND OTHERS to WOLSEY. The Mayor of this town lately received a letter from my Lord Deputy, intimating Wolsey's pleasure that he should commit to ward Chamberlain's servant and Roger's servant, to be kept till Wolsey's pleasure be further known. The Mayor did so, and examined such writings as were found upon them; among which was the enclosed letter, written by John Knolles to Chamberlain, which the Mayor showed us all here in the King's council chamber. Refer the whole matter to Wolsey. Have apprehended Knolles and John Harington, named in the letter. Calais, 2 June. Signed by Sir John Wallop, William Briswode, Sir Robt. Wingfield, Christopher Garneys and Sir W. Husey. P. 1. Add. Endd. : "A letter from Sir John Husey, Garnisshe, with other, concerning Chamberlain's servant, and Rogers." 4322. P. DE VILLERS LYSLE ADAM to Priors WM. WESTON, of England, and JOHN RAWSON, of Ireland. 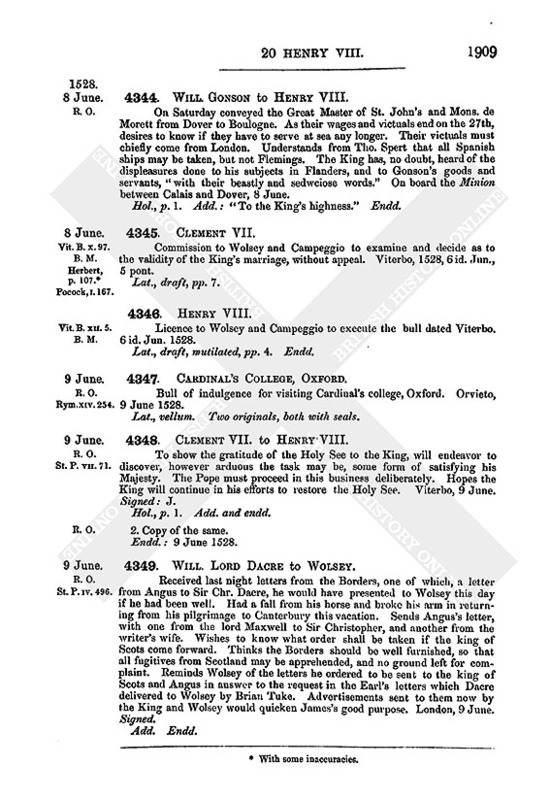 While at Viterbo authorized Docwra, Weston's predecessor, John Babington, Turcopolier, and Albon Pol, bailiff of the Eagle, to make an exchange of the preceptory of Sampford with Wolsey. Appoints Weston in place of Docwra, and adds Rawson to the others. The Priory near London, 2 June 1528. Signed: F. Thomas Bosius, vicecancell. Sealed. Cal. B. II. 178. B. M.
4323. ELIZABETH DACRE to LORD DACRE. Encloses a letter from Angus to her uncle, requiring Dacre's advice what should be done if the king of Scots come down, as Angus expects. If Dacre come not home, he had better ascertain Wolsey's pleasure. Encloses also a letter from Maxwell to her uncle, showing his crafty mind; which the latter not perceiving, came to the place accustomed for redress. 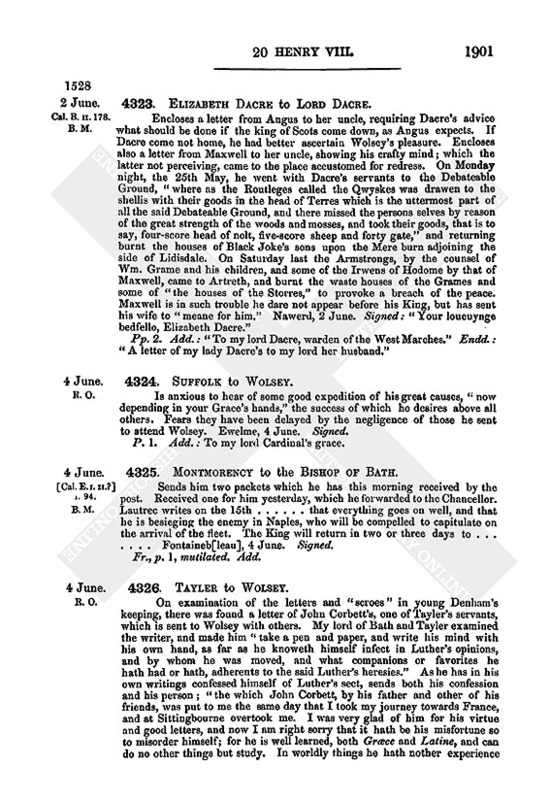 On Monday night, the 25th May, he went with Dacre's servants to the Debateable Ground, "where as the Routleges called the Qwyskes was drawen to the shellis with their goods in the head of Terres which is the uttermost part of all the said Debateable Ground, and there missed the persons selves by reason of the great strength of the woods and mosses, and took their goods, that is to say, four-score head of nolt, five-score sheep and forty gate," and returning burnt the houses of Black Joke's sons upon the Mere burn adjoining the side of Lidisdale. On Saturday last the Armstrongs, by the counsel of Wm. Grame and his children, and some of the Irwens of Hodome by that of Maxwell, came to Artreth, and burnt the waste houses of the Grames and some of "the houses of the Storres," to provoke a breach of the peace. Maxwell is in such trouble he dare not appear before his King, but has sent his wife to "meane for him." Nawerd, 2 June. Signed: "Your loueuynge bedfello, Elizabeth Dacre." Pp. 2. Add. : "To my lord Dacre, warden of the West Marches." Endd. : "A letter of my lady Dacre's to my lord her husband." Is anxious to hear of some good expedition of his great causes, "now depending in your Grace's hands," the success of which he desires above all others. Fears they have been delayed by the negligence of those he sent to attend Wolsey. Ewelme, 4 June. Signed. P. 1. Add. : To my lord Cardinal's grace. [Cal. E. I. II. ?] I. 94. B. M.
4325. MONTMORENCY to the BISHOP OF BATH. Sends him two packets which he has this morning received by the post. Received one for him yesterday, which he forwarded to the Chancellor. Lautrec writes on the 15th ... that everything goes on well, and that he is besieging the enemy in Naples, who will be compelled to capitulate on the arrival of the fleet. The King will return in two or three days to ... Fontaineb[leau], 4 June. Signed. Fr., p. 1, mutilated. Add. On examination of the letters and "scroes" in young Denham's keeping, there was found a letter of John Corbett's, one of Tayler's servants, which is sent to Wolsey with others. My lord of Bath and Tayler examined the writer, and made him "take a pen and paper, and write his mind with his own hand, as far as he knoweth himself infect in Luther's opinions, and by whom he was moved, and what companions or favorites he hath had or hath, adherents to the said Luther's heresies." As he has in his own writings confessed himself of Luther's sect, sends both his confession and his person; "the which John Corbett, by his father and other of his friends, was put to me the same day that I took my journey towards France, and at Sittingbourne overtook me. I was very glad of him for his virtue and good letters, and now I am right sorry that it hath be his misfortune so to misorder himself; for he is well learned, both Græce and Latine, and can do no other things but study. In worldly things he hath nother experience nor activity; in study of good letters miram felicitatem ac capacitatem et insuperabilem diligenciam." Hopes Wolsey will therefore "have compassion of age (fn. 1) and his humble submission and meek revocation of his errors." Poissy, 4 June 1528. Signed: Jo. T., Mter of the Rolls. P.1. Add. Endd. 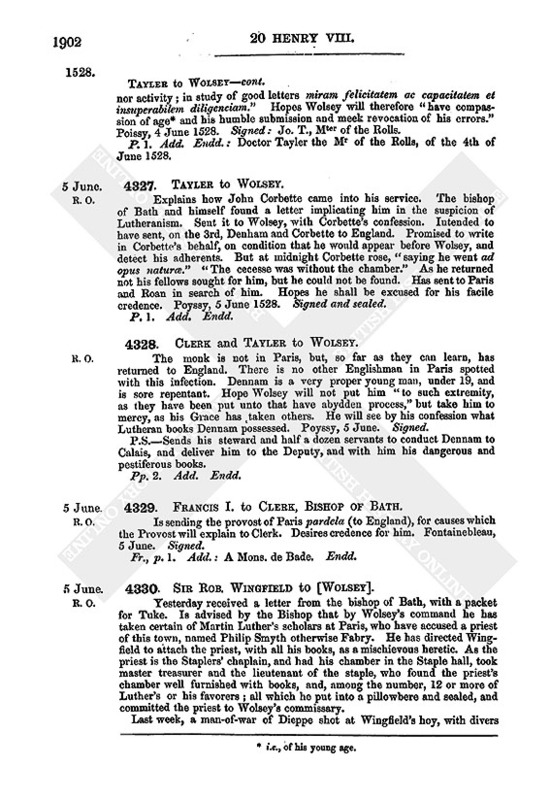 : Doctor Tayler the Mr of the Rolls, of the 4th of June 1528. Explains how John Corbette came into his service. The bishop of Bath and himself found a letter implicating him in the suspicion of Lutheranism. Sent it to Wolsey, with Corbette's confession. Intended to have sent, on the 3rd, Denham and Corbette to England. Promised to write in Corbette's behalf, on condition that he would appear before Wolsey, and detect his adherents. But at midnight Corbette rose, "saying he went ad opus naturæ." "The cecesse was without the chamber." As he returned not his fellows sought for him, but he could not be found. Has sent to Paris and Roan in search of him. Hopes he shall be excused for his facile credence. Poyssy, 5 June 1528.Signed and sealed. 4328. CLERK and TAYLER to WOLSEY. The monk is not in Paris, but, so far as they can learn, has returned to England. There is no other Englishman in Paris spotted with this infection. Dennam is a very proper young man, under 19, and is sore repentant. Hope Wolsey will not put him "to such extremity, as they have been put unto that have abydden process," but take him to mercy, as his Grace has taken others. He will see by his confession what Lutheran books Dennam possessed. Poyssy, 5 June. Signed. P.S.—Sends his steward and half a dozen servants to conduct Dennam to Calais, and deliver him to the Deputy, and with him his dangerous and pestiferous books. 4329. FRANCIS I. to CLERK, BISHOP OF BATH. Is sending the provost of Paris pardela (to England), for causes which the Provost will explain to Clerk. Desires credence for him. Fontainebleau, 5 June. Signed. Fr., p. 1. Add. : A Mons. de Bade. Endd. 4330. SIR ROB. WINGFIELD to [WOLSEY]. Yesterday received a letter from the bishop of Bath, with a packet for Tuke. Is advised by the Bishop that by Wolsey's command he has taken certain of Martin Luther's scholars at Paris, who have accused a priest of this town, named Philip Smyth otherwise Fabry. He has directed Wingfield to attach the priest, with all his books, as a mischievous heretic. As the priest is the Staplers' chaplain, and had his chamber in the Staple hall, took master treasurer and the lieutenant of the staple, who found the priest's chamber well furnished with books, and, among the number, 12 or more of Luther's or his favorers; all which he put into a pillowbere and sealed, and committed the priest to Wolsey's commissary. Last week, a man-of-war of Dieppe shot at Wingfield's hoy, with divers others coming from Winchelsea with woad. The Frenchmen ransacked the hoy, and would have taken a Fleming who belonged to Wingfield, and did damage to other vessels. Wrote a letter to the captain of Boulogne, who sent a written reply (enclosed), and told the messenger that the vessel was not in his jurisdiction. The messenger, on his return, met the captain going to Boulogne with all the mariners, and accordingly went back with him to demand justice. The mariners were immediately delivered, but no redress could be obtained. The hoys dare not venture out again, so that the town is in danger of being left unprovided with timber, malt, and beer. Last week also a crayer of London, laden with beer, was driven into Boulogne. A Fleming, the beer brewer's prentice, being on board, was taken by one Robt. Reynolds, an Englishman, who serves at Boulogne as a horseman. Wrote to the captain of Boulogne about this, and received an answer, enclosed. The master of the crayer has come hither with the prisoner, for whose ransom they have taken 20 barrels of beer. Represents the urgent necessity of this town. Has done his utmost to relieve it, of his own accord. Calais, 5 June 1528. 4331. RIC. BROKE to WOLSEY. At the sessions of Oier Determyner, held at Rochester Castle, on Thursday in Whitsun week, there were present lord Cobham, Mr. Comptroller, Sir Edw. Guldeforde, Sir Alex, Culpeper, and Master Wotton, knts., Broke's brother, Mr. Shelley, Baron Hales, and Broke, the King's commissioners; Sir Thos. Nevell, Mr. Wylloughby, sergeant-at-law, and the King's solicitor, of the King's learned council, and a good number of people in quiet order. There were attainted Nic. Love, fuller, Robt. Bankes, cutler, John Burley, laborer, Ric. Bayley, miller, Wm. Grastroste, shoemaker, John Ongley, laborer, and Thos. Smyth, smith, of high treason. John Gyrdeler, weaver, and Thos. Love, junr., tailor, were indicted of the same, but not taken. Wm. Lyngfeld, weaver, John Parke, Hen. Kyrry, Henry Joys, laborers, John Rode, smith, John Freman, shoemaker, Wm. Ware, laborer, Wm. Love, yeoman, Edm. Wylde, fuller, and Thos. Nyklyn, minstrel, were indicted of misprision. Sir Thos. Newell, Mr. Willoughby and the King's solicitor gave evidence against them. At first they denied their own confessions, but this morning they have all confessed they deserve death, except Thos. Smyth, whom they say they falsely accused, and for whom they ask mercy; in which all the commissioners join, except Cobham and Guldeford, who are absent. Broke's brother, Shelley, has instructions to speak about it to Wolsey. Kent is in good order, but the old term of principiis obsta is executed upon the said evil-disposed persons. Rochester, Friday in Whitsun week. Signed. Pp. 2. Add. : To my lord Legate and Cardinal's good grace. Endd. : Mr. Broke, the juge, of the 5th of June. Galba, B. VIII. 4. B. M.
4332. BRIAN TUKE to the BISHOP OF LONDON. Have fled to Steponeth for fear of this infection, a servant of mine being ill at my house in London. Received last night a packet of letters from Wolsey, addressed to you and me. As it was late, and I dislike to come to London, I opened it, and found a letter likewise addressed, with others, which I send. The King and my lord Cardinal wish either you or me to come to court for information on certain points about the truce. If I go, I must go in my wagon, which is at my house in Essex, and cannot be here today, for I have a disease in vesica, of which Wolsey is aware, and was almost whole; but coming hither from London last night as softly as could be, has made me as ill as before. Besides, I doubt if it would be right to go to the King, having had such a visitor in my house. You could easily satisfy the King. As to the King's desire that my Lady should be bound to make restitution if any Spaniards took Englishmen, it is more than any Prince is or w[ould be] bound to make restitution of injuries done by their subjects, even in a treaty of perpetual peace. The King thinks, if his subjects may be taken on the coasts of Spain, why may they not do the like to the Spaniards ? The answer is, they may in any place, having once come as far as the Spanish harbors, where the truce has no force; "in such wise as when the lady Margaret's folks had agreed thereunto, the French ambassador, talking with my lord Legate in the garden at Hampton Court late in an evening, I being present, and the Lady's folks absent, gave great thanks to my said Lord for that point," as both the French and English might pass to the havens of Spain to do exploits of war; and whenever they wished to return, the Spaniards could not hurt them, when once they got on this side the said havens. The French ambassador expected that by this means his master would work the Spaniards sorrow on those seas. For everything on this side it must be provided that redress be made as in time of peace, so that no man may rob on land or sea. In haste, at Stepney, 3 o'clock, a.m., in my bed. P.S.—The letter to Gonson came to me open; that to my Lady I will send to her secretaries, who left early yesterday morning. I send also all the treaties and writings, that you may take with you such as you think good. Will forward Gonson's letter, if the King think fit, and you send it to me, and will seal it with my own seal; for my lord Cardinal, when I was at Hampton Court, ordered that it should be sent open to Fitzwilliam, but I see Mr. Peter has sealed it by mistake. Hol., pp. 3, mutilated. Add. : To my lord of London, lord Privy Seal. Titus, B. I. 82. B. M.
2. 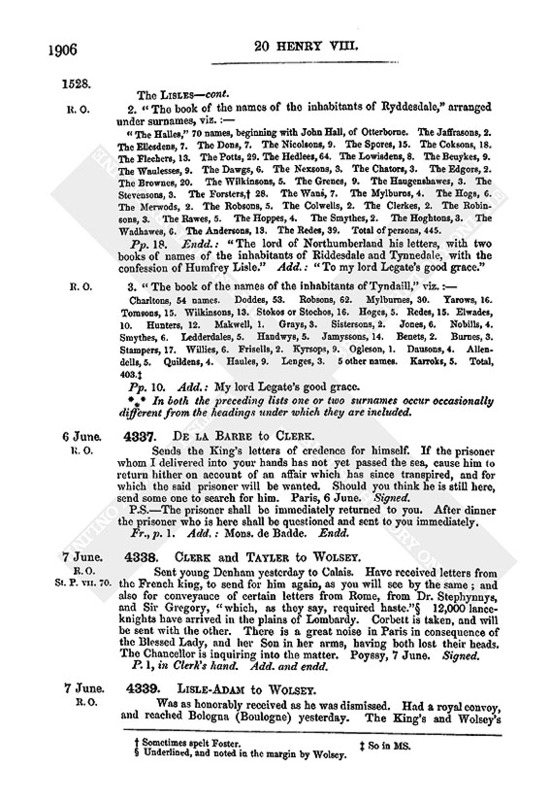 Copy of the preceding, in Tuke's own hand. Titus, B. I. 91. B. M.
Cannot move, afoot or on horseback. Has a "wagon" that is accustomed to carry his children. Will come in that cart, and on his knees, rather than fail, if it be the King's pleasure; but his house has had the infection. It is not to be expected the lady Margaret will make restitution for injuries done by the Spaniards. Discusses the point touching the right of the Spaniards to apprehend Englishmen in certain havens. Encloses his letter to the bishop of London concerning this matter. Sends him Gonson's letter, and one to the king of Scots, requiring haste. Stepney, Friday. P.S.—Sends the treaties for the King's consideration. Hol., pp. 4. Begins: Right Honorable Sir. 4334. SIR EDWARD GULDEFORD to WOLSEY. 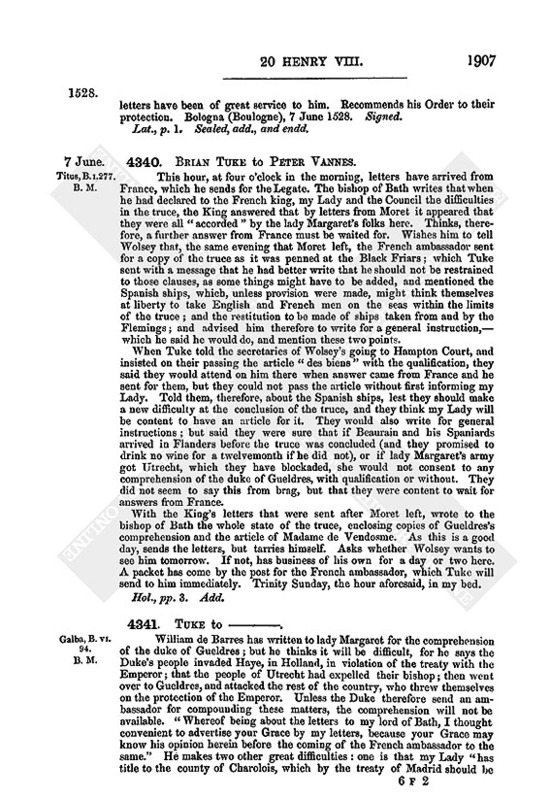 A letter sent about 12 days ago by Brian Tuke to Sandwich, to arrest the King's ship The Mary and John, laden by Anthony Cavalare with beans, came to the hands of the mayor of Winchelsea. As the ship was within the jurisdiction of the Cinque Ports, the Mayor informed Guildford, who immediately caused her to be arrested, and put his own officers on board to keep her. Tuke has since sent letters of commandment, dated London, 2 June, for the delivery of the same ship, "which I suppose," ... * * * Begs that matters touching the jurisdiction of his office be henceforth directed to him or his deputy at Dovor Castle. Halden, 5 June. Signed. Mutilated, p. 1. Add. : [My lord C]ardinalles [grace]. R. O. St. P. I. 289. 4335. THOMAS HENNEGE to WOLSEY. Has explained to the King the matter concerning the mastership of St. Bartholomew's Spital, and moved his Grace to send Master Wylson to you. The King would be glad if you brought the appointment into your own hands, that he and you may put him or some other good man in. His Highness says that your Grace was always accustomed to be with him "as upon Monday night," and therefore looks for you. Mistress Anne is very well amended, commends herself unto you, "and thinketh long till she speak with you." The King sends you a buck he killed yesterday in Eltham park. Greenwich, Saturday night. Signed. Add. : To my Lord's grace. Endd. "Humphrey Lysle, gentleman, sworn and examined, the 6th day of June, anno R. H. VIIIvi, xxo, upon such offences as have been heretofore, by Sir William Lysle, knight, deceased, father unto the said Humphrey, himself, and other their servants, confederates, adherents, and parttakers, committed, contrary to the King's laws." 1. About twelve months ago, he and his father, with about 40 persons, Scots and English (of whom all the English have since been put to execution), attacked Newcastle, compelled the keepers of the castle to surrender the keys, and delivered nine prisoners. 2. Shortly afterwards they came to Weytherington, intending to have taken or slain Sir Will. Elerkare, if he had issued out of the town, and took away 20 horses from the fields. 3. With about 140 persons, chiefly Scots, banished men and outlaws, they spoiled and burned Holmeshalgh in Northumberland. 4. On attacking Weytherington a second time they took prisoner and ransomed Michael Vynell. 5. In returning to Scotland they took prisoner four of my lord of Northumberland's company, three of whom they liberated without ransom. 6. They burned three or four houses in Thropell, and took three prisoners. 7. Burned Lynton, a farm-house of Sir Will. Elerkar's, and drove away 43 cattle. 8. Humphrey himself and four servants burned the house of Roger Heyron in Eshed; 9. drove away 60 head of cattle from Toggesdeyne, 17 from Moryke, 20 from Hawkesby, and 60 horses from Over and Nether Buston. 10. Humphrey and his servant John Ogle, disguised as beggars, met two men of Staumford harnessed on horseback, and robbed them of their horses and spears. 11. He and four servants plundered a house in Wooddon of household stuff to the value of 46s. 8d. 12. He took two horses from Anthony Lylborne. 13. Took 14 head of cattle from Whittell, and 8 from Hen. 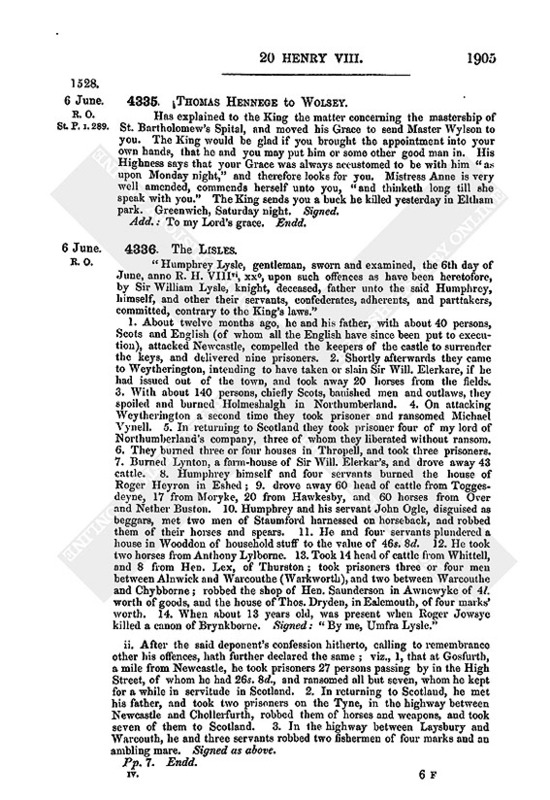 Lex, of Thurston; took prisoners three or four men between Alnwick and Warcouthe (Warkworth), and two between Warcouthe and Chybborne; robbed the shop of Hen. Saunderson in Awnewyke of 4l. worth of goods, and the house of Thos. Dryden, in Ealemouth, of four marks' worth. 14. When about 13 years old, was present when Roger Jowsye killed a canon of Brynkborne. Signed: "By me, Umfra Lysle." ii. After the said deponent's confession hitherto, calling to remembrance other his offences, hath further declared the same; viz., 1, that at Gosfurth, a mile from Newcastle, he took prisoners 27 persons passing by in the High Street, of whom he had 26s. 8d., and ransomed all but seven, whom he kept for a while in servitude in Scotland. 2. In returning to Scotland, he met his father, and took two prisoners on the Tyne, in the highway between Newcastle and Chollerfurth, robbed them of horses and weapons, and took seven of them to Scotland. 3. In the highway between Laysbury and Warcouth, he and three servants robbed two fishermen of four marks and an ambling mare. Signed as above. "The Halles," 70 names, beginning with John Hall, of Otterborne. The Jaffrasons, 2. The Ellesdens, 7. The Dons, 7. The Nicolsons, 9. The Spores, 15. The Coksons, 18. The Flechers, 13. The Potts, 29. The Hedlees, 64. The Lowisdens, 8. The Beuykes, 9. The Waulesses, 9. The Dawgs, 6. The Nexsons, 3. The Chators, 3. The Edgors, 2. The Brownes, 20. The Wilkinsons, 5. The Grenes, 9. The Haugenshawes, 3. The Stevensons, 3. The Forsters, (fn. 2) 28. The Wans, 7. The Mylburns, 4. The Hogs, 6. The Merwods, 2. The Robsons, 5. The Colwells, 2. The Clerkes, 2. The Robinsons, 3. The Rawes, 5. The Hoppes, 4. The Smythes, 2. The Hoghtons, 3. The Wadhawes, 6. The Andersons, 13. The Redes, 39. Total of persons, 445. Pp. 18. Endd. : "The lord of Northumberland his letters, with two books of names of the inhabitants of Riddesdale and Tynnedale, with the confession of Humfrey Lisle." Add. : "To my lord Legate's good grace." Pp. 10. Add. : My lord Legate's good grace. * In both the preceding lists one or two surnames occur occasionally different from the headings under which they are included. 4337. DE LA BARRE to CLERK. Sends the King's letters of credence for himself. If the prisoner whom I delivered into your hands has not yet passed the sea, cause him to return hither on account of an affair which has since transpired, and for which the said prisoner will be wanted. Should you think he is still here, send some one to search for him. Paris, 6 June. Signed. P.S.—The prisoner shall be immediately returned to you. After dinner the prisoner who is here shall be questioned and sent to you immediately. Fr., p. 1. Add. : Mons. de Badde. Endd. R. O. St. P. VII. 70. 4338. CLERK and TAYLER to WOLSEY. Sent young Denham yesterday to Calais. Have received letters from the French king, to send for him again, as you will see by the same; and also for conveyance of certain letters from Rome, from Dr. Stephynnys, and Sir Gregory, "which, as they say, required haste." (fn. 4) 12,000 lanceknights have arrived in the plains of Lombardy. Corbett is taken, and will be sent with the other. There is a great noise in Paris in consequence of the Blessed Lady, and her Son in her arms, having both lost their heads. The Chancellor is inquiring into the matter. Poyssy, 7 June. Signed. P.1, in Clerk's hand. Add. and endd. Was as honorably received as he was dismissed. Had a royal convoy, and reached Bologna (Boulogne) yesterday. The King's and Wolsey's letters have been of great service to him. Recommends his Order to their protection. Bologna (Boulogne), 7 June 1528. Signed. Lat., p. 1. Sealed, add., and endd. 7 June. Titus, B. I. 277. B. M.
4340. BRIAN TUKE to PETER VANNES. This hour, at four o'clock in the morning, letters have arrived from France, which he sends for the Legate. The bishop of Bath writes that when he had declared to the French king, my Lady and the Council the difficulties in the truce, the King answered that by letters from Moret it appeared that they were all "accorded" by the lady Margaret's folks here. Thinks, therefore, a further answer from France must be waited for. 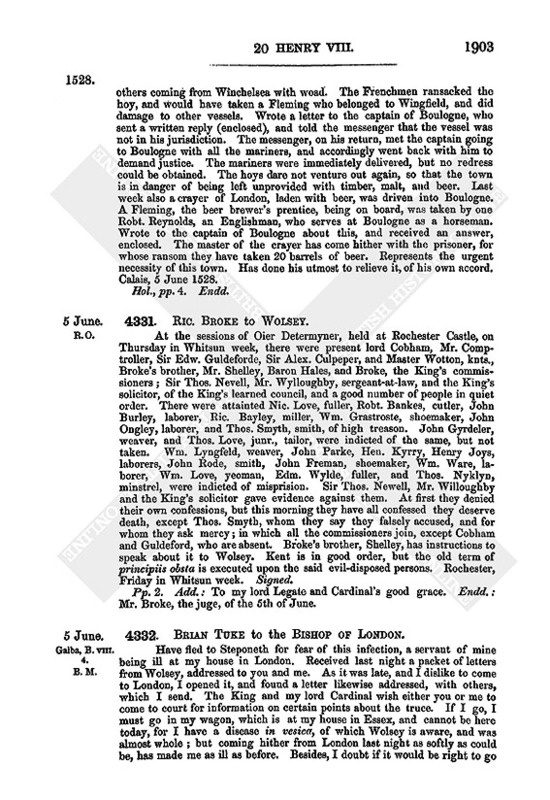 Wishes him to tell Wolsey that, the same evening that Moret left, the French ambassador sent for a copy of the truce as it was penned at the Black Friars; which Tuke sent with a message that he had better write that he should not be restrained to those clauses, as some things might have to be added, and mentioned the Spanish ships, which, unless provision were made, might think themselves at liberty to take English and French men on the seas within the limits of the truce; and the restitution to be made of ships taken from and by the Flemings; and advised him therefore to write for a general instruction,—which he said he would do, and mention these two points. 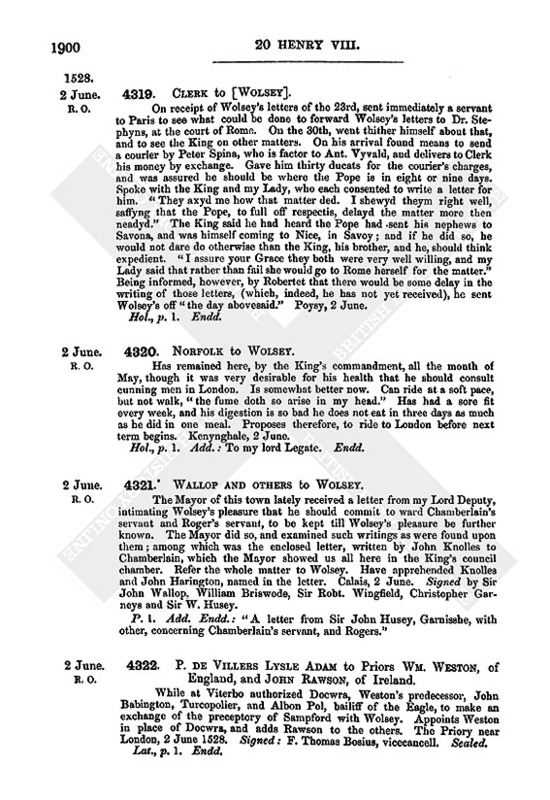 When Tuke told the secretaries of Wolsey's going to Hampton Court, and insisted on their passing the article "des biens" with the qualification, they said they would attend on him there when answer came from France and he sent for them, but they could not pass the article without first informing my Lady. Told them, therefore, about the Spanish ships, lest they should make a new difficulty at the conclusion of the truce, and they think my Lady will be content to have an article for it. They would also write for general instructions; but said they were sure that if Beaurain and his Spaniards arrived in Flanders before the truce was concluded (and they promised to drink no wine for a twelvemonth if he did not), or if lady Margaret's army got Utrecht, which they have blockaded, she would not consent to any comprehension of the duke of Gueldres, with qualification or without. They did not seem to say this from brag, but that they were content to wait for answers from France. With the King's letters that were sent after Moret left, wrote to the bishop of Bath the whole state of the truce, enclosing copies of Gueldres's comprehension and the article of Madame de Vendosme. As this is a good day, sends the letters, but tarries himself. Asks whether Wolsey wants to see him tomorrow. If not, has business of his own for a day or two here. A packet has come by the post for the French ambassador, which Tuke will send to him immediately. Trinity Sunday, the hour aforesaid, in my bed. Galba, B. VI. 94. B. M.
William de Barres has written to lady Margaret for the comprehension of the duke of Gueldres; but he thinks it will be difficult, for he says the Duke's people invaded Haye, in Holland, in violation of the treaty with the Emperor; that the people of Utrecht had expelled their bishop; then went over to Gueldres, and attacked the rest of the country, who threw themselves on the protection of the Emperor. Unless the Duke therefore send an ambassador for compounding these matters, the comprehension will not be available. "Whereof being about the letters to my lord of Bath, I thought convenient to advertise your Grace by my letters, because your Grace may know his opinion herein before the coming of the French ambassador to the same." He makes two other great difficulties: one is that my Lady "has title to the county of Charolois, which by the treaty of Madrid should be delivered to her, exempt from all higher jurisdiction." If that article pass, Vandosme shall have his lands, which she now holds. Secondly, the prince of Orange is kept from his lands in Burgundy, and in recompence has part of the lands of Vandosme given him by the Emperor. He fears also Marnyx is detained by the French in his way to the French court, and declares that Mountferar has levied 6,000 lanceknights, with which, if the truce fail, he will go into France; if otherwise, into Italy. 4342. KATERYN HENEGE to CROMWELL. Asks him to despatch these two friars with my lord's Grace's alms as shortly as possible. Sent by Ric. Eton to ask him to make a deed of feoffment of the lands her husband purchased in Lincolnshire of Master Chamberlain. Molsaye, Trinity Sunday. Hol., p. 1. Add. : To my especial friend Mr. Cromwell. Endd. Cal. D. X. 197. B. M.
Mutilated. Modern heading: 8 Ju[ne]. 4344. WILL. GONSON to HENRY VIII. On Saturday conveyed the Great Master of St. John's and Mons. de Morett from Dover to Boulogne. As their wages and victuals end on the 27th, desires to know if they have to serve at sea any longer. Their victuals must chiefly come from London. Understands from Tho. Spert that all Spanish ships may be taken, but not Flemings. The King has, no doubt, heard of the displeasures done to his subjects in Flanders, and to Gonson's goods and servants, "with their beastly and sedwciose words." On board the Minion between Calais and Dover, 8 June. Hol., p. 1. Add. : "To the King's highness." Endd. Vit. B. X. 97. B. M. Herbert, p. 107. (fn. 5) Pocock, I. 167. 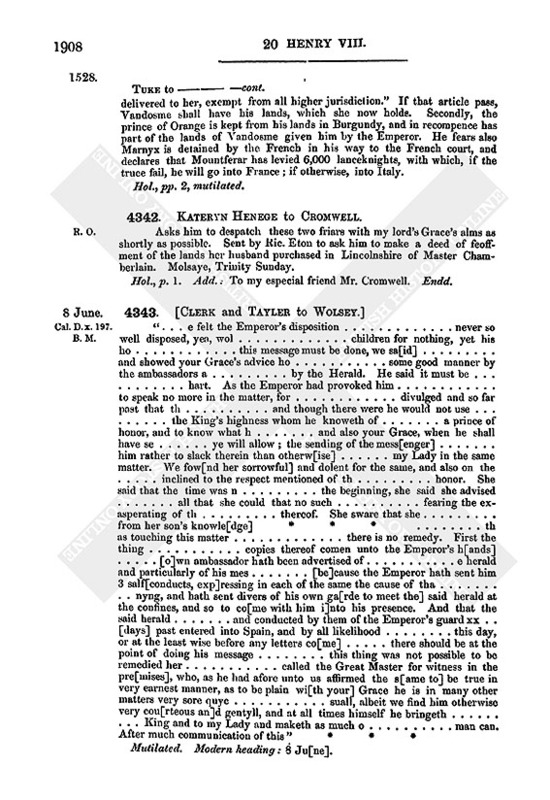 Commission to Wolsey and Campeggio to examine and decide as to the validity of the King's marriage, without appeal. Viterbo, 1528, 6 id. Jun., 5 pont. Vit. B. XII. 5. B. M.
Licence to Wolsey and Campeggio to execute the bull dated Viterbo. 6 id. Jun. 1528. Lat., draft, mutilated, pp. 4. Endd. R. O. Rym. XIV. 254. Bull of indulgence for visiting Cardinal's college, Oxford. Orvieto, 9 June 1528. Lat., vellum. Two originals, both with seals. R. O. St. P. VII. 71. 4348. CLEMENT VII. to HENRY VIII. To show the gratitude of the Holy See to the King, will endeavor to discover, however arduous the task may be, some form of satisfying his Majesty. The Pope must proceed in this business deliberately. Hopes the King will continue in his efforts to restore the Holy See. Viterbo, 9 June. Signed: J. Hol., p. 1. Add. and endd. 2. Copy of the same. R. O. St. P. IV. 496. 4349. WILL. LORD DACRE to WOLSEY. Received last night letters from the Borders, one of which, a letter from Angus to Sir Chr. Dacre, he would have presented to Wolsey this day if he had been well. Had a fall from his horse and broke his arm in returning from his pilgrimage to Canterbury this vacation. Sends Angus's letter, with one from the lord Maxwell to Sir Christopher, and another from the writer's wife. Wishes to know what order shall be taken if the king of Scots come forward. Thinks the Borders should be well furnished, so that all fugitives from Scotland may be apprehended, and no ground left for complaint. Reminds Wolsey of the letters he ordered to be sent to the king of Scots and Angus in answer to the request in the Earl's letters which Dacre delivered to Wolsey by Brian Tuke. Advertisements sent to them now by the King and Wolsey would quicken James's good purpose. London, 9 June. Signed. 4350. RIC. BANK to CROMWELL. Sent his servant yesterday to Mr. Haydon to ask if any privy seals had gone out against the persons mentioned in the enclosed bill; and he sends word that both attachments and privy seals had been sent out. Asks him to procure a letter to restrain them, from Mr. Chancellor to Sir Alex. Osboldstone, sheriff of Lancashire, and to Robt. Parker, messenger within the county palatine. Reminds him that the Chancellor wrote to Banks, at the instance of the duke of Suffolk, last Easter, that Banks's sureties might tarry at home; and now attachments are sent down for them. Will be utterly undone if Crumwell does not help him. From the Cow in Southwark, Tuesday morning, 9 June. Hol., p. 1. Add. : To the right worshipful Mr. Crumwell at Hampton Court. Endd. 4351. SYNOD HELD AT ELY. Statutes made by the Synod of Ely, held 9 June in the convent church of Barnewell. 1. No layman who comes to the diocese of Ely from any other place shall be admitted to marriage within a year of his arrival. If he has contracted marriage, no curate shall celebrate it without a testimonial from the ordinary of the place where he formerly resided, or unless he is reported to be of honest conversation in the parish. 2. Rectors, vicars and curates are to read the Exoneratorium curatorum in their churches every year. 3. No priest or chaplain newly arrived in the diocese may be admitted to serve cures by rectors or vicars for more than one month, without examination by the bishop or his officer, on pain of suspension for two months. 4. No person is to be allowed to publish the liberties and privileges of brotherhoods, hospitals, &c., or to ask for alms for them, without licence from the bishop. 5. Parish clerks must wear surplices while serving the priests at high mass. 6. No curate, chaplain or priest is to perform mass in "ruggid gownes." 7. Rectors and curates must not allow Bibles according to the new interpretation to be used in their churches, or employ them for their sermons. 8. Two solemn processions are to be held every week until St. Peter's ad Vincula. 9. Four commemorations have been held in the diocese, time out of mind, excepting in places where the church is dedicated to St. Mary or St. Etheldreda, and in East Hatly church, and some churches in the deanery of Shingay. 10. The Feast of the Translation of St. Mary Magdalen is celebrated on March 19. 11. 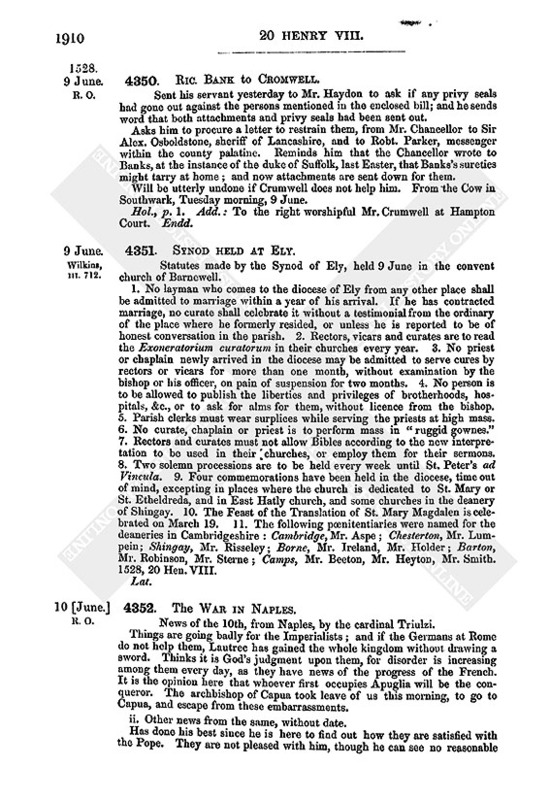 The following pœnitentiaries were named for the deaneries in Cambridgeshire: Cambridge, Mr. Aspe; Chesterton, Mr. Lumpein; Shingay, Mr. Risseley; Borne, Mr. Ireland, Mr. Holder; Barton, Mr. Robinson, Mr. Sterne; Camps, Mr. Beeton, Mr. Heyton, Mr. Smith. 1528, 20 Hen. VIII. 4352. The WAR IN NAPLES. News of the 10th, from Naples, by the cardinal Triulzi. Things are going badly for the Imperialists; and if the Germans at Rome do not help them, Lautrec has gained the whole kingdom without drawing a sword. Thinks it is God's judgment upon them, for disorder is increasing among them every day, as they have news of the progress of the French. It is the opinion here that whoever first occupies Apuglia will be the conqueror. The archbishop of Capua took leave of us this morning, to go to Capua, and escape from these embarrassments. ii. Other news from the same, without date. Has done his best since he is here to find out how they are satisfied with the Pope. They are not pleased with him, though he can see no reasonable cause. Some say that he has not kept the time for the first payment; moreover, that Frenchmen did whatever he counselled them. Whatever be the fact, they say his Holiness left Orvieto on the 5th for Ancona, being bound by a secret declaration against the Imperialists. These latter seem to be in the greatest disorder; and if Lautrec pushes on, as he seems to be doing, it is thought that this kingdom is in great danger. A bishop who is the soul of the archbishop of Capua (qual e l'anima de l'arcivescovo de C.) said yesterday that the Archbishop had been in doubt what to do amid all these novelties, whether to go to Ischia or to Gaeta, but had changed his purpose, and determined to place himself in this castle. Does not know about the progress of the war, or how they get supplies of money. Many are very anxious, and they say Don Hugo is in despair. Cannot speak of the protests made of the prince of Malfi in Apruzo, and of the general disorder of the Imperial forces. Our courtesies, &c. are at end. ("Le nostre careze, cortesie et trattamenti buoni sonno resoluti.") It is eighteen days since we arrived, and we have not left our chambers, except once. Don Hugo has not come to see us, nor has anything been heard of him. R. O. St. P. II. 133. 4353. PIERS EARL OF OSSORY to HENRY VIII. After the taking of the baron of Delvyn, the vice-deputy, by O'Conour, Kildare's son-in-law, the Irishry determined to aid O'Conour to destroy the Pale, hoping that the King would be moved to release Kildare, and send him here to rule again. Rode to their country, and with no little trouble separated them by policy and promise of reward, of which he wrote to the Council in Ireland. Thought it dangerous to have war with O'Conour without knowing the King's pleasure, as he still has war with the earl of Desmond, whom the Brenis aid more than ever. Asks for orders. Waterford, Corpus Christi Eve. Signed. Deposition of Thos. 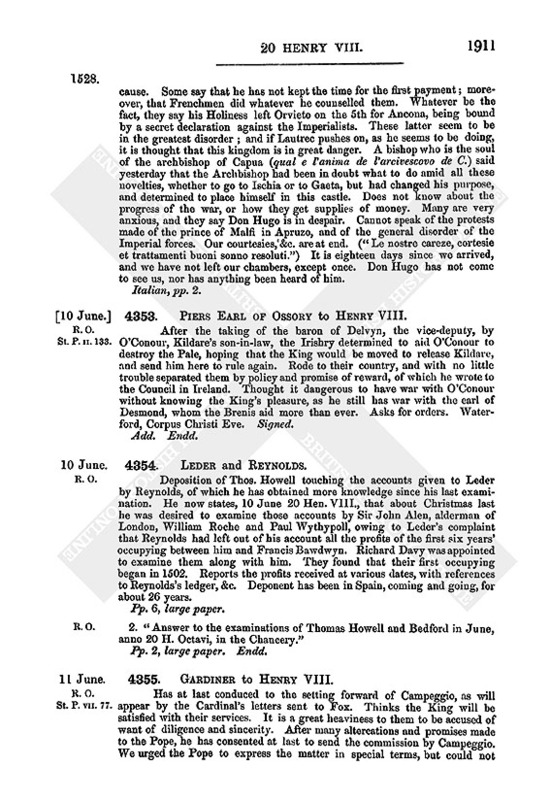 Howell touching the accounts given to Leder by Reynolds, of which he has obtained more knowledge since his last examination. He now states, 10 June 20 Hen. VIII., that about Christmas last he was desired to examine those accounts by Sir John Alen, alderman of London, William Roche and Paul Wythypoll, owing to Leder's complaint that Reynolds had left out of his account all the profits of the first six years' occupying between him and Francis Bawdwyn. Richard Davy was appointed to examine them along with him. They found that their first occupying began in 1502. 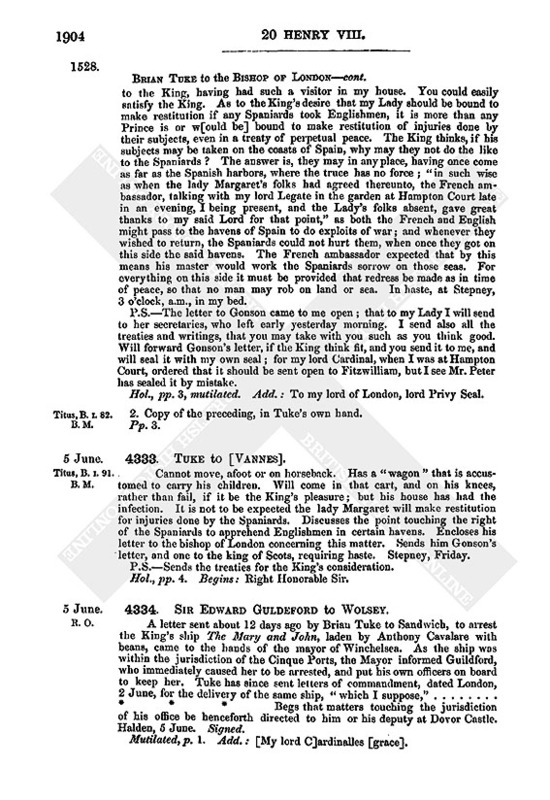 Reports the profits received at various dates, with references to Reynolds's ledger, &c. Deponent has been in Spain, coming and going, for about 26 years. 2. "Answer to the examinations of Thomas Howell and Bedford in June, anno 20 H. Octavi, in the Chancery." Pp. 2, large paper. Endd. 1. i.e., of his young age. 4. Underlined, and noted in the margin by Wolsey.